I absolutely loved the solo adventure in the 1983 Red Box Player’s Manual. As a tribute I thought it would be fun to convert it to a 5E mini dungeon that a 1st level party could explore. I tweaked the dungeon to make it group friendly but tried to stay pure in terms of the original encounters. Enjoy! This small dungeon crawl takes place inside the recently unearthed tomb of a Shar priestess. Shar. Also known as Mistress of the Night, she presides over caverns, dark, dungeons, forgetfulness, loss, night, secrets, and the Underdark. A group of enterprising goblin looters discovered the tomb after a season of torrential rain revealed its once hidden entrance. Not particularly smart the goblins became stumped by a large metal seal inside the tomb. Determined to get what treasures may be hidden beyond the door they hatched a plan. After some disastrous trial and error the goblins were able to lure a rust monster inside the tomb. As expected the creature gleefully consumed the metal seal. Unfortunately for the goblins they have been unable extract the treasure beyond because of the skeletal guardians that emerged. Further complicating things is the rust monster which has stubbornly decided to stay in the tomb. Acting as a complete glutton it dissolved most of the goblin’s equipment this morning. The PC’s will learn of the tomb from some cave spelunkers and arrive late morning to investigate it. They warn that another adventurer went inside alone and is said to have run out terrified and has not been seen since. The climb up the broken path takes some time as the mountain air thins. Wisps of breath emanate from you are your companions as you find the cave the hunters spoke of. The muddy earth around the entrance is churned and riddled with small booted footprints. There is a gaping hole which appears to be connected to an ancient stone stair case leading down. Curious PC's will notice the small prints in the mud are roughly the size if a child's foot. The room you have entered is around twenty five feet square, with exits in the middle of the north, east, and west walls. The ceiling of the room is approximately 15’ high but lost in the shadows. The walls and floor are crafted from cut rock riddled with small cracks. Standing in the center of the room is the stone statue of a woman holding a sword and shield. It appears the statue was once painted but it has mostly peeled and faded with time. Any PC’s taking the time to stop and listen (Perception DC10) will notice squeaking sounds coming from the east. This small room appears to be a jumble of trash which contains broken objects such as oil decanters, wines bottles, pottery, dishes and baskets. The smell of offal is thick here as if something has been using the space as a lair. A group of giant rats has claimed this area as their own and will defend it if the PC’s start probing the broken items in the chamber. Giant Rat: (4) Page 327 of the D&D Monster Manual. Treasure: If searched thoroughly the PC’s will find some ancient coins inside two unbroken clay pottery pieces. 100cp and 100sp. The room beyond is oddly empty and completely clean. The only feature is a strange orange mouth superimposed on the far wall, about 8’ long in size. If the PC’s try to leave the way is blocked by an invisible force. “You must answer, y’know!” bellows the mouth. If they guess the answer correctly double the amount of coins each of them carries. If not, it all disappears, and the characters are left with none. The answer is “E.” The letters stand for One, Two, Three, four, Five, Six, and Seven. The “next in the series” is Eight! Note: Any treasure taken by this enchantment appears deeper in the tomb. This narrow chamber contains recessed stone shelves filled with rotted bolts of cloth, jars, vases and cutting tools. Standing in the center room are two goblins who look up, startled, as one growls something in its own language. The other smiles at you, and says in broken common “Why, hello there! What can we do for you?” The growling goblin starts heading north, apparently leaving the room. If any of the PC’s speak goblin they will understand the growling goblin to say, “Distract them”. It then will get its companions to help deal with the adventurers. Goblin (4): Page 166 of the D&D Monster Manual. Exchange scimitars for wooden clubs. 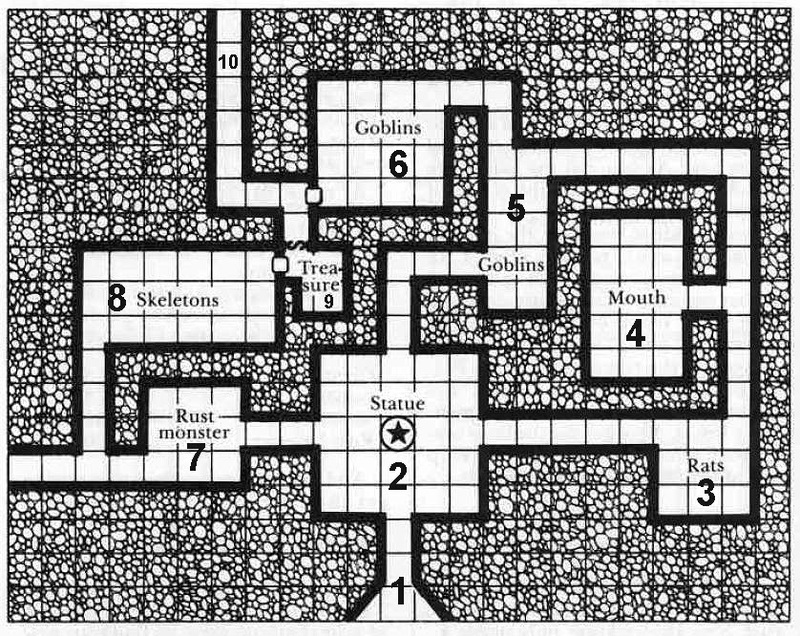 Treasure: The goblins have 1d6 sp. One of them carries two potions of healing. This room contains rotted wooden couches gilded in black opal, small tables and stools. In the northwest corner is what remains of an ornate bed which lies splintered on the ground. This chamber is decorated with some of the furniture which once belonged to the priestess interred here. If searched it looks as though the goblins destroyed the bed to fashion their clubs with. The couch contains 10 small black opals (10gp each) which can be carefully extracted. The PC’s will also find one small bag by the door, apparently dropped by one of the goblins. The bag contains 10 sp, 5 gp, and an stone key! Any attempts to open the stone door (even with they key) leading to areas 9 & 10 will fail. This room was once painted with murals depicting the accomplishments of a priestess. Most are faded now and very hard to follow. The strangest feature however is the large piles of reddish dust everywhere. Suddenly you hear a snort and see an alien looking creature emerge from one of the piles. It looks like a giant armadillo with a long tail, and has 2 feathery feelers on the front. Rust Monster (1): Page 262 of the D&D Monster Manual. If the party of adventurers is large make the encounter more difficult by giving the rust monster maximum hit points. The creature will stop attacking and ignore the PC’s once there is no additional metal to consume. Treasure: There is 30 more black opals (10gp each) strewn about the chamber under rust piles. As you peer into the room, you see four skeletons with rusty swords standing about 10’ from you, around the corner. Then without warning some force awakens them, infusing their bones with a dark vitality. They let out an unearthly howl and charge you! Skeleton (4): Page 272 of the D&D Monster Manual. This chamber is stocked with many items of false value which have been previously rummaged through by the goblin looters. The northeast corner contains a large pile of rust similar to the ones in area 7. It looks as though there was once some sort of metal seal in place. A wooden door rests beyond the rust pile which is cracked open. The skeletons came from the small treasury beyond. The room is empty except for one large stone box and four guardian niches. Murals on the wall suggest this may have been a wedding dowry which was never used and left here for the afterlife. The stone lid is approximately 15lbs and covered in etched runes. A successful DC 20 Intelligence (Arcana) check recognizes they are a warning to tomb robbers to leave. Any character actively searching for traps may make a DC15 perception check to notice odd slits in the stone floor. Those aware of a potential trap may make a DC11 Dexterity check to avoid it when activated. Otherwise unaware PC’s who remove the lid will fall victim to a blade trap and take 1d10 points of damage. Treasure: The stone box contains 500 cp, 200 sp, 100 gp and a Haunted Sword +1. Any PC with a Passive Perception of 12 or higher will notice a lever inside one of the wall niches the skeletons came from. If pulled the secret door leading to area 10 will groan in protest as it opens. A narrow corridor of stone leads away from this area into palpable darkness. In the distance you see a flickering light which is suddenly extinguished followed by the shriek of a goblin. What horrors await deeper in the tomb only time and the brave can tell! If you enjoyed this little conversion and would like to potentially see it expanded please let me know. Or perhaps you have been inspired to add more chambers and rooms yourself. That stone key the players found unlocks something! Rumor has it the priestess is not very happy about all these interlopers in her domain.